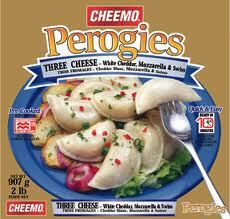 On Checkout 51’s list this week (Sept 12-18, 2013) is Cheemo perogies, 907 g or more, any variety. All Cheemo perogies are precooked and only need to be reheated before serving. Canadian Pan Fried – A traditional favourite. Cover bottom of frying pan with cooking oil, margarine, or butter and heat to 190⁰C (375⁰F), or medium heat. Place frozen perogies into frying pan and fry for approximately 3-4 minutes until golden brown. Then turn perogies over and brown on other side for 3-4 minutes. Remove and serve with your choice of favourite toppings like sour cream, onions, or bacon bits. You will get $1.00 cash back rebate at Checkout 51. Here’s a pic of what it looks like. I found a couple prices of it at a few stores. I didn’t find any Cheemo coupons to use.